Getting a reservation was actually pretty straightforward, despite the slightly daunting wording on the reservation page of the website. I simply emailed the concierge at my hotel (the terrific Cerulean) two months in advance with the date and time I wanted and hey presto! Many Michelin starred restaurants in Tokyo tend not to want to reserve directly to a visitor so, if you can, definitely use the services of your hotel. I also hear of several enterprising firms that will reserve top restaurants for a fee. We ordered the Spring tasting menu which started with a hot dish charmingly titled "Changing from Winter to Spring" with a subtitle of seasonal vegetables with "pine nuts" dressing and a sip of "clams" clear soup. The menu is full of "inverted commas", so I've decided to keep them in the description of each course, so bear with me. This first dish knocked the ball out of the park in terms of the flavour scale - I actually got goose bumps on my first bite of this dish. It contained 16 vegetables including white and green asparagus, mushrooms, a fern quill and crunchy pine nuts. There was a gentle smokiness to the dish thanks to the white asparagus which had been straw-smoked. The smoke was really more of a scent than a flavour. This is gonna sound weird, but the smokiness coupled with the other fresh earthy vegetables evoked something like a forest walk. Just close your eyes and you're there. On the side was a small cup of clam broth enhanced by some yuzu freshness. We then moved onto "Grilled Firefly Squids" Egg Custard with "Butterbur leaves" Soup and "Green Peas". The seasonal firefly squids, which actually glow in the dark when they're still swimming, have only a very short season and were just flamed to impart another hint of smokiness, echoing the first dish. Ingredients here included the slightly bitter butterbur (a new one for me), as well as shiso flowers and green peas. There were lots of different flavours going on here which hit taste buds I don't think have been touched before. Next, we were served a soup, which I have to admit is just about the best thing I've eaten. Titled "Ichiban Dashi Soup" with "Kuruma Prawn" Dumpling and "Simmered Abalone", the bowl of clear soup before me looked deceptively simple. The dashi soup had been prepared two minutes earlier, while the dumpling made from the prawn flesh was topped with a thick slice of mochi, which became slightly gooey from the warmth of the broth. Floating in the soup were a couple of slices of bamboo, cut to mimic the shape and texture of the sliver of abalone which bobbed on the other side of the shallow bowl. The dumpling was sweet and textural and so incredible that I nibbled my way through it increasingly slowly to make every mouthful last. The mochi added an interesting chewy but soft texture to the dish. I'm not a huge fan of abalone since I find the flavour quite delicate and elusive but I liked the texture of this. We changed pace, and temperatures, with a selection of sashimi which started with squid (at 9 o'clock in the photo above). The squid was beautifully sliced, almost into ribbons, which gave it a fan-like appearance, and contributed to the delicate texture. Heading clockwise in the photo, there is bonito, which had a hint of ginger and soy. Chives were included too adding some crunch while there was also a punchy hit of wasabi. The incredibly tender sea bream had a zesty ponzu sauce with some more chives. Further around there are two types of clam (one is a surf clam and the other had a Japanese name that I wasn't familiar with but was rare and seasonal), topped with a wasabi flower. Some more fruit was in this combination with the addition of sudachi, which had a slightly peachy flavour to it. The next dish included more squid, white shrimp and baby scallop which were slathered in a sauce of sea cucumber intestine. Sea cucumber intestine is definitely an acquired taste - it smells a bit like a rockpool at low tide and I'm not a huge fan. The final dish in the centre was a sort of soup with a base of abalone liver, tofu and horse hair crab. The liver was incredibly creamy and earthy with a subtle seawater flavour. Another hit of citrus prevented it from cloying. Two joyful mouthfuls followed. "Kinki fish" from Hokkaido Grilled on Charcoal "Grilled Eggplant" Stuffed Inside (on the left of the photo) and then the amazing Grilled "Avocado" with Sea Urchin. The fish was simple and smoky, with the eggplant stuffed inside a small cavity. The avocado and urchin was also a simple concept but what a combination. The ripe, flame-grilled avocado had a similar texture to the creamy urchin, but the dish was given some crunchiness with the addition of semi dried seaweed. This was undoubtedly the best uni I've eaten. Interestingly, the chef served some pickled fuji apple here too - a playful riff on the typical pickled ginger. I had some reservations about the next course, "Chicken Wing Tip" filled with "Shark Fin", Rich Chicken Starch Sauce and Chopped Vegetables. I've never eaten shark's fin before, but have been curious as to why it is regarded as a delicacy in certain cultures. The shark's fin was pretty stringy and, to me, had a very subtle flavour. I consider it more of a textural element, since it was quite crunchy with a sort of collagen texture a little bit like jellyfish. A small but delicious crunchy panko-crumbed sweetbread shared the bowl. The dish had surprisingly clear and simple flavours which contrasted nicely to the previous course. The only beef course was next, with a thick piece of coal-grilled wagyu tenderloin. The meat was tender with a richly earthy flavour and came topped with a medley of eight vegetables including more butterbur, some potato and edamame beans. The dish was called Wagyu Beef "Filet" Grilled on charcoal with assortment of Vegetables and Spring Fragrance. One of the signature dishes of Ryugin, and a typical progression in a kaiseki meal, is a rice dish but of course here it comes with a bit of a twist. 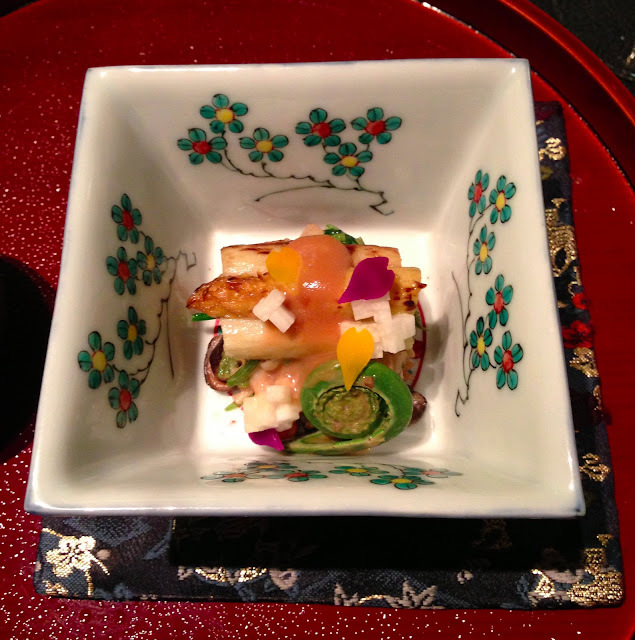 It was called "Sanshoo pepper Rice" with Seasonal Vegetables in Spring presentation, Miso Soup and pickles. Beautifully cooked rice was topped with a delicate combination of dried chunks of sea bream which were mixed with the slightly fiery sansho pepper. There were more smoky and citrus notes to the rice topping with a mild numbing effect which I enjoyed. Another pickled dish, made from 10 vegetables, including corn, was included while the miso soup, made with a shrimp base, was a great palate cleanser. Perhaps because we committed the cardinal Japanese etiquette faux pas of eating every last grain in the first rice dish, we were offered a second rice course which was not on the menu. Of course I couldn't turn down an offer of more food although some tables, stupefyingly, did. In this dish, small seasonal sakura ebi were served over the rice, with a cherry blossom tea. The delicious little morsels had been deep fried at a high temperature meaning the outside shell was slightly crunchy while the inside remained creamy. These salty prawns were another tasty new ingredient for me. By this stage, we were ready for something sweet and the first dessert is something of a classic. Called "One Piece of Strawberry -196C - +99C", the chef flirts with some Heston-style trickery. 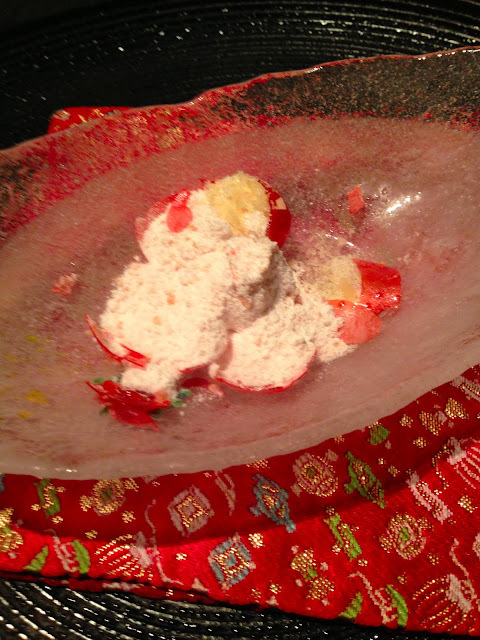 We were presented with a "strawberry", which is flash frozen using liquid nitrogen (there's the reference to the -196C!). ...which is then topped with a hot strawberry "jam" (aha, there's the 99C temperature!). The playful hot and cold combination was enhanced by a kind of popping candy explosion with each mouthful. Sensational flavours, with a good dash whimsy, made this a fun, refreshing dessert. The final dessert was a fluffy Oyaki. 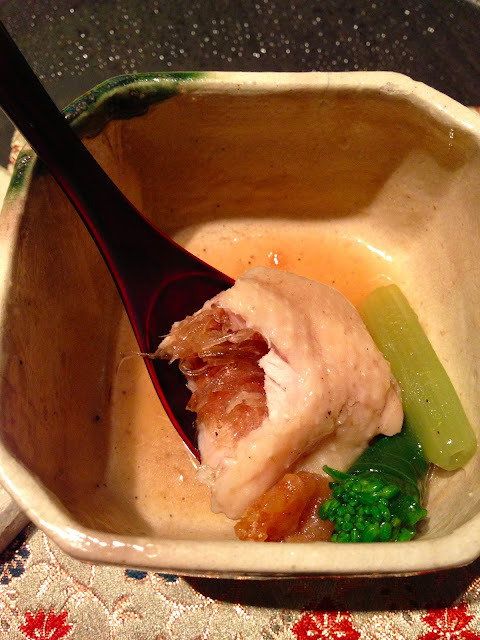 This one was cooked in a traditional wooden sake vessel. The light fluffy, slightly brioche-textured sponge came with some smooth creamy milk ice cream. At the bottom of the soufflé was a rich red bean "sauce". I could have happily eaten a second helping. We finished the meal with tea. 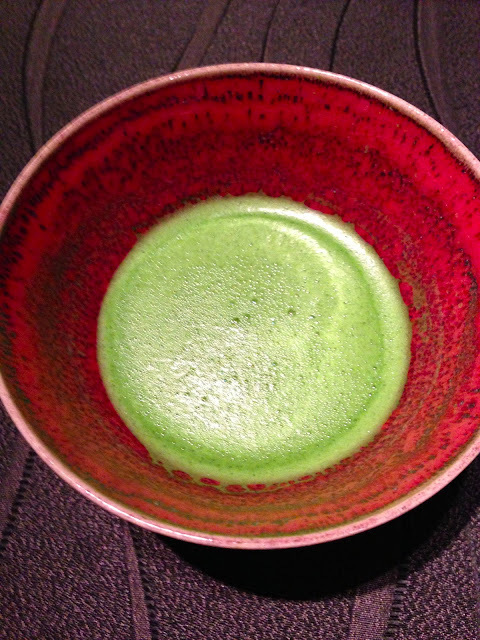 Bright green, freshly whipped, matcha came first followed by two courses of Taiwanese oolong tea for digestion. The first serve of oolong had a beautiful flavour, with a peachy floral nose. With the second glass, we were told that it was brewed at a different temperature to the first, giving it a deeper flavour. The nose on this glass was more like caramel. I also noticed that other diners weren't served the tea. Maybe it was because Mr B and I showed few signs of leaving as we sat there talking about the incredible meal that had just passed. The wine list is, as you would expect of a three star place, immense. We left the decisions in the hands of our waitress/sommelier. We drank champagne to begin with (a French grower that I forgot to take note of), and then chose sake to accompany other courses. With the first sake, we were presented with a tray of various glassware to chose from. 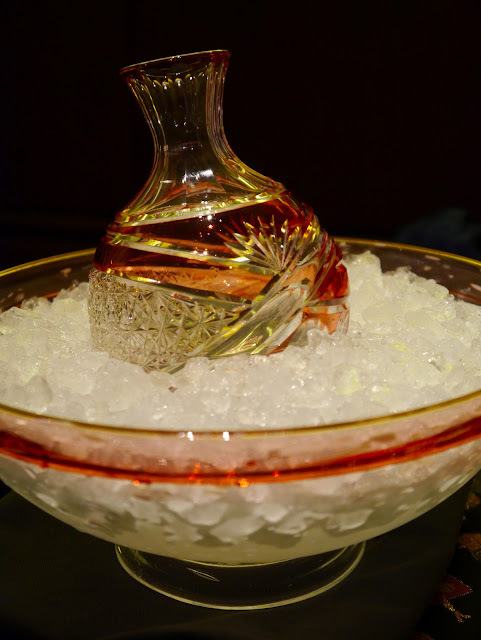 The glasses were then matched with a beautiful sake carafe and ice-filled bowl. 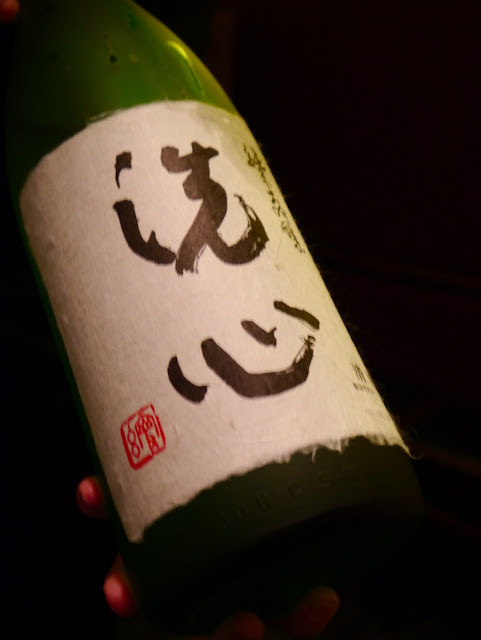 With the wagyu, we were offered a different sake which was much darker than the first. Again I forgot to take note. Everything in the meal came together pretty much seamlessly. The food was flawlessly executed, rooted in tradition but pushing boundaries in terms of technique. This was a wonderfully well composed menu too. I loved the progression - some ingredients or techniques were repeated, bringing back memories from earlier courses and tying everything together. I guess you could call it harmonious. I've only had a couple of other meals that have left a similar impression on me. Tetsuya's in Sydney back in 2001 and Arzak in 2006 are two meals that I still look back on as benchmarks for me, probably because they were the first time I experienced cooking of such originality. But Ryugin exceeded even my high expectations. If you love to eat, go. You won't be disappointed.